Texas Oncology has been exploring how their patients with cancer have kept life positive and growing. They have produced a series of short films that focus on “… stories of the fighters, believers, and survivors who’ve inspired us with their determination and hopeful spirit.” Recently, yours truly was the subject of one of these stories. I have been a patient at Texas Oncology for over 3 years and two years ago I took up horse riding. 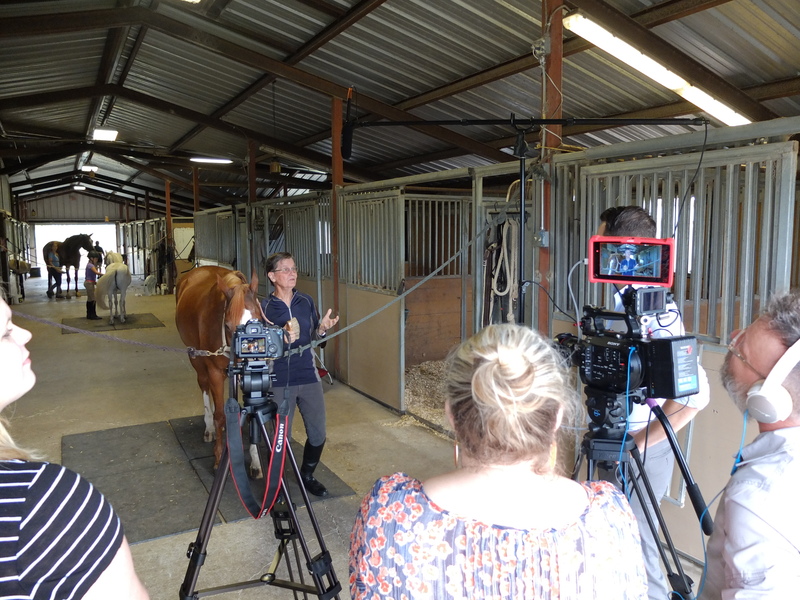 My physician, James Uyeki, thought my equestrian endeavors would ft into this series of short films. He was right. 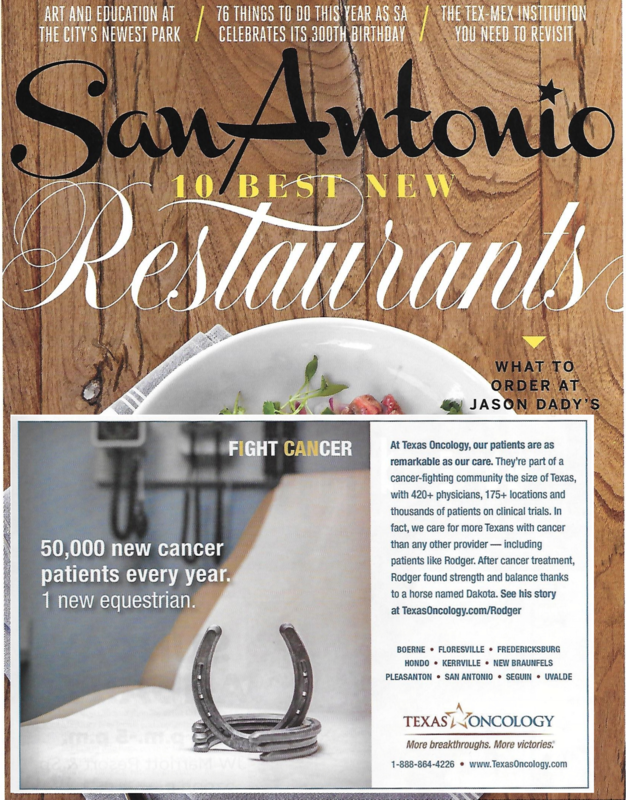 The film is now part of the Texas Oncology website and has been featured in an ad in the January 2018 issue of San Antonio Magazine. Watch the film at Texas Oncology. My riding began as a lark and over time I grew to find it both an intellectual and physical challenge. Dakota and I can trot and canter. We can jump small fences with a single bound. Currently, I am focusing on dressage. 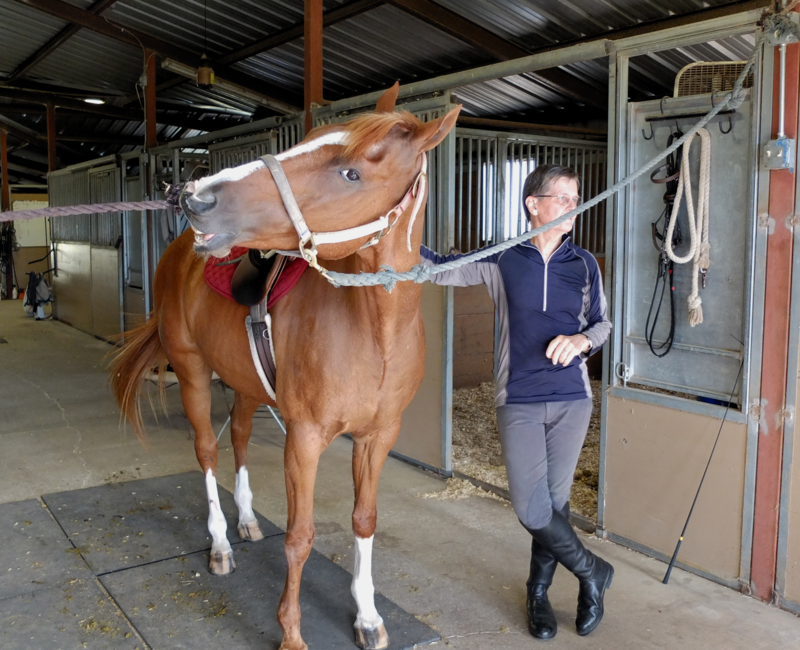 Dressage calls for an almost transparent bond between horse and rider and achieving that level of control and communication is a most difficult challenge. Riding has helped be to be stronger and more balanced and my bond with Dakota is quite amazing. 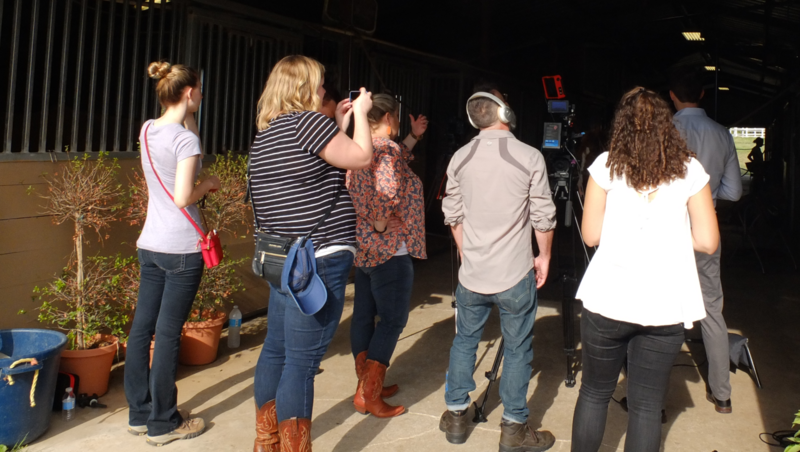 The film was shot at Bel Canto Farms on a hot August morning. There was quite a crew there and a behind the scenes pic is below. The people in the photo are: Amanda Cowherd (junior copywriter), Sarah Green (Texas Oncology client), Michele Evans (art director), Jim Webb (videographer), Michelle Wells (Texas Oncology client), and James Hamilton (writer). Kim Bissell (Account Supervisor) took the photo. The film was made by HCB Health of Austin, Texas for Texas Oncology. Texas Oncology gave me permission to include the film here as well. Finally, a pic of the two camera shoot set-up. I LOVE it!! Rodger and Suzanne are a great team. What a great video and a wonderful message. You and Dakota did a great job. A really good video! We are looking forward to seeing Dianne and you after Thanksgiving. We will leave Lubbock to arrive at your house Sunday, November 26, in the afternoon and spend the night. We would like to see you ride!